I was right, no one else booked into my room last night, so there were just the 3 of us, how lucky is that? I had a pretty good sleep aside from being woken up by an old man who snores like a fog horn. There was meant to be a solar eclipse about 7:30am, but unfortunately there is so much low cloud here you would never know. It's a pretty overcast and drizzling morning, which I sort of expected being at this altitude and a bad weather forecast. It's also much cooler up here, so sleeping in the car tonight will be fun. I got up about 9am when the drizzle stopped, but the low cloud was still something else. Everywhere was like driving through a smoke screen. I read that 'The Grand Canyon' is a good trail for these conditions as your right down in the bottom of the Canyon, so I set off there. It west of Katoomba and just before the next main town of Blackheath. Sure enough it was still super cloudy there too; there was a 'lookout' point, but you could see literally nothing but fluffy whiteness, so I followed the path down the side of the canyon right down into the base. Once you got to the bottom it was much more clear, and you are surrounded by rainforest for most of the walk. You follow the trail for about 3km along the floor of the canyon, and it places it's quite clostraphobic as the walls are close to you on either side as you hop from stone to stone along the creek running through the bottom. There are other cool areas where you are half way up the sides and have to duck down as you walk around under huge overhanging rock ledges, right next to the virtical drop on the other side (but there is a railing to stop you toppling over..). Eventually you real the other end and the you twist and turn winding all the way back up to the top of the canyon again. You pop out about 2km from the car park and just walk down the road you come in on to get back. When I got back I went to the lookouts again as the cloud was thinning and I could not belive my eyes. Where there had been just endless white before there was now an absolutely incredible view across and down the canyon. You would have had absolutely no idea it was there if you didn't wait for a couple of hours for the cloud to part. There was still quite a lot of cloud lingering so I don't think the photos will come out brilliantly, but hopefully they will at least partly show how incredible the view was. From 'Evans Lookout' and 'The Grand Canyon' I went a few Km down the road to 'Govetts Lookout' where you can walk to 'Horseshoe Waterfall'. Unfortunately the cloud was back when I got there, so you couldn't see a thing. I will try and come back again to check it out on a clearer day (im praying tomorrow is nicer!) to go up to the waterfall. 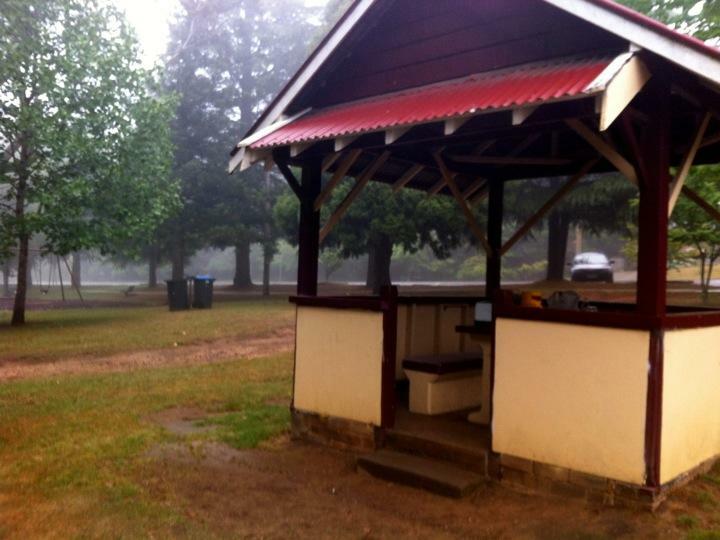 I then went up to Wentworth Falls as talking to someone they said it was clear in Katoomba. When I got there it wasn't too bad, but 15 minutes later the weather got 10 times worse; wind came in, bringing even thicker cloud than before and rain with it. So I went back to the car. I went into Katoomba and traded my finished book in at a book shop for a new on, figuring at least that could keep me entertained for the rest of the day. Then went and had a coffee at a nice little cafe with free Internet for an hour. While on the web I checked the weather forecast, and all my optimism was gone in a flash; 2/3 days of weather just like today, fog + drizzle. WHAT DID I DO TO DESERVE THIS LUCK?! I will stay here tonight and just see what it's like in the morning I guess. If its like today though I'm not going to be able to see anything on the walks, so I may as well just call time on the mountains and go back to the coast. I really dont want to do that as I was looking forward to so nice scenery, but apparently that won't happen. Later I found a park with some benches under cover to cook some dinner. It's flipping cold though; some people I spoke to at Wentworth Falls said their car was indicating 12 degree. Later spent one of the worst 15 minutes of my time in Australia trying to find somewhere to sleep. The conditions are absolutely disgraceful; fog you can't see more than 20m in, dizzle covering all the windows so you can't see properly, humidity steaming up the car and darkness made fuzzy by street lights and fog. It's a good job no one was about crossing the road as you'd have no hope of seeing them. Eventually i just had to pull up on a verge in a quiet street outside someone's house, by which time I had just given up caring. I just threw all my stuff in the front seats and climbed in the back. It wasn't even worth making the effort to put the 'curtains' up. (Photo - a delightful evening cooking dinner).